· 8.4 - Why are there Seasons? The zones of the Earth�s major winds: the trade winds and the westerlies. There were two situations that the sailing captains of old had to avoid at all costs. One was to be captured by a pirate. The other was to have the wind die down to nothing and have to sit around in the doldrums, sails flapping, with no prospect of getting fresh water or meat or vegetables any time soon. Fortunately, in the zone of the "trade winds" the second problem arose but rarely. The trade winds (named centuries ago by sailors on trade ships) are quite reliably blowing from the east at an angle to the equator such that they bring air from higher latitudes to the equatorial "zone of convergence". Thus, the smart captains sought out the trades to go west (and they sailed fast). In the high pressure regions at the eastern edge of the ocean basins where the trade winds originate, the climate is typically hot, sunny, and dry (Baja California, for example); as the winds move westward across the oceans, they gain moisture, which is eventually dumped at the western side of the ocean basins. A diagram illustrating Columbus� first route to the New World (in red) and the trade winds he used to get there (in black). Columbus return trip was powered by the Westerlies. and they are the most conspicuous part of the wind system on the planet and the most steady (demonstrated by the phrase, "the wind blows trade," that is, on track). 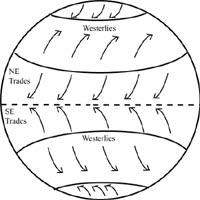 When the trade winds hit the western edge of an ocean basin, the winds turn first toward the poles, and then loop back east to become prevailing westerlies (winds flowing to the east from the west). These westerlies, for example, are what powered Columbus� sailing vessel on the return trip to Europe. The westerlies are also responsible for the far better surfing on the Pacific side of North America compared to the Atlantic side. On the Pacific side, the westerlies blow in the same direction as waves rolling toward shore from storms out at sea, building up their height. In the Atlantic, the prevailing winds blow against the incoming waves, shrinking them down to sizes that are less than adequate for surfers. The trade winds are part of a circulation of air, a "cell" when seen in profile, which starts with rising air in the tropics. This rising air is driven by the energy received from the Sun, which is virtually overhead at the equator all year. The air�s vertical motion implies "convergence," that is, the air rising from the bottom of the atmosphere is replaced by winds blowing from higher latitudes. This mechanism for making trade winds was first postulated by the famous astronomer and atmospheric physicist Edmond Halley, in 1686. There was, however, a problem with Halley's proposition: he did not explain why the winds actually blow as much from the east as is observed. What keeps the trade winds from going straight to the convergence zone at the equator? This conundrum was solved by the English meteorologist George Hadley (1685-1768) and this is why we talk about a "Hadley Cell" rather than a "Halley Cell.� Hadley realized that wind particles moving toward the equator would come from a region of lower eastward velocity and enter a region of higher eastward velocity as they moved toward the equator. Thus, the wind would have a westward motion, as indeed observed. George Hadley published his theory in a famous paper "Concerning the Cause of the General Trade Winds," in 1735. This was exactly one hundred years before Gustave-Gaspard Coriolis (1792-1843) produced the equations describing motions in a rotating coordinate system. Thus, Hadley had it right, but we now credit Coriolis for the description of how the winds bend toward the west of their path when they move toward the equator. Either way, the trade winds have a strong easterly component, and they feed the convergence zone and the rise of the air there. Diagram illustrating how Hadley cells create the trades. The rising warm air in the tropics creates a �void� that is filled by air coming from higher latitudes, thus giving rise to the trade winds. 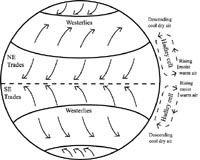 The compensating air flow for the trade wind is a kind of anti-trade wind in the uppermost troposphere, located above the trades, where the flow of air is going east and away from the convergence. The compensating flow for the rise of the air in the convergence is the downward motion of air in the desert zone, centered between 20 and 30° latitude. This falling air heats up as the pressure increases and is therefore greatly under-saturated with water vapor. This produces clear skies, evaporation at the sea surface (or soil) and general aridity. (To verify this check the positions of the major deserts on a map.) Surface air from subtropical regions returns towards the equator (as the Trade Winds) to replace the rising air, so completing the cycle of air circulation within the Hadley cell.